A lot has happened in the past two months that I haven’t had time to write about. One thing that truly deserves mention, in more ways than one, was the Armenian Pizza we had in March. Our friends Jaja and Ben were visiting for the Jerusalem Marathon, and we took them to Mt. Zion. We lost track of time and found ourselves at Zion Gate at two o’clock, famished and not in any condition to go hunting for a place to eat. Right inside the Gate was this quaint cafe called Nakashian Gallery run by an Armenian lady (her name escapes me at the moment), and we decided to take our chances (sooo unlike me, but then hunger does things to people). To get to the cafe, one has to go through a wonderful gallery of handcrafted glass, hats, and other accessories. 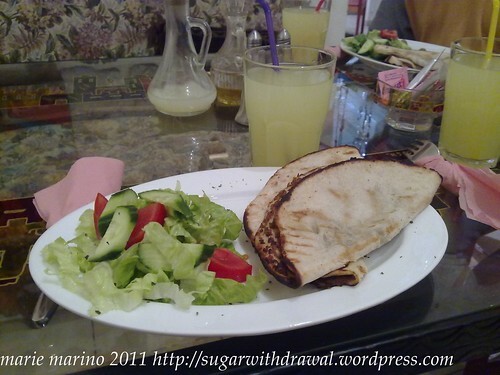 The Armenian pizza that she recommended was unequivocally wonderful, along with the accompanying salad and desserts. Everything, including the items in the gallery, were hand-made by her. We had so much fun eating and trying out the hats that we ran a few minutes late for our next appointment. Those few minutes meant everything, because by the time we got to where we were supposed to go, the roads were blocked and the sirens were blaring. That pizza saved us from a lot of heartache. For an obsessive-compulsive like myself, it also served as a reminder that delays can also be good things. In this instance, it was the Universe’s way of telling me that wherever I am, that is where I am meant to be.